How to use ValueConverter (Decimal Converter) during data binding with control? | How to enable required field validator in a particular row of GridView? Windows 8 and 10 comes with .NET framework 4 or higher pre-installed, but there are lots of applications require the .NET framework v3.5 installed to install on these newer version of operating systems. These applications will not run unless you will install the required version of .NET framework. When you try to run any such sort of applications then Windows 8 and 10 will prompt you to download and install .NET framework 3.5 from the Internet. However, this will take a lot of time. 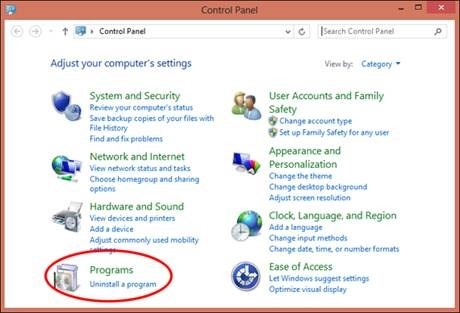 Click Turn Windows features on or off, and the user will see window as image below. 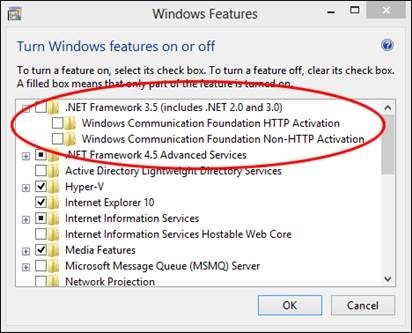 You can enable this feature by click on .NET Framework 3.5 (include .NET 2.0 and 3.0) select it and click OK. After this step, it will download the entire package from internet and install the .NET Framework 3.5 feature. You can save your time and install .NET Framework 3.5 from the Windows 8 and 10 installation media respectively. This method is much faster and does not even require an Internet connection. Bring your installation media to prepare installation either it is DVD or ISO image. If you are using ISO image then mount it using software e.g. Power ISO, DAEMON Tools so then you will be able to access the files for the installation. Packages are located in the drive letter: \sources\sxs directory. Open CMD.EXE with Administrative Privileges. 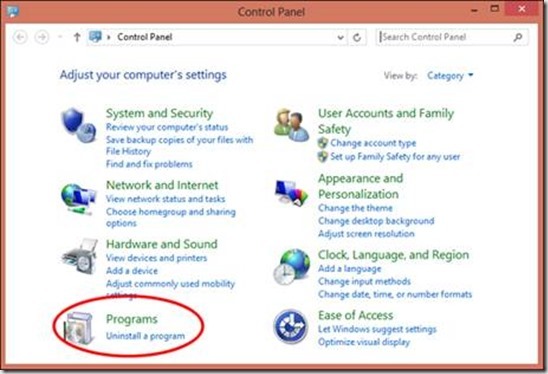 Right click on the start button (or press “Win + X”) to popup the system menu. There you will find a menu item titled “Command Prompt (Admin)”. 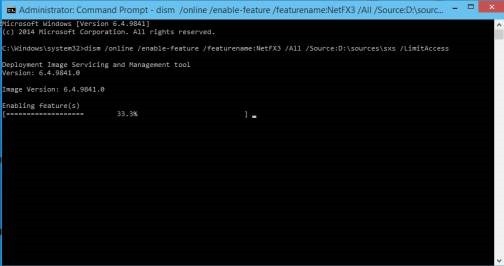 Click on this to launch the command prompt in admin mode. Run the following command and hit Enter. 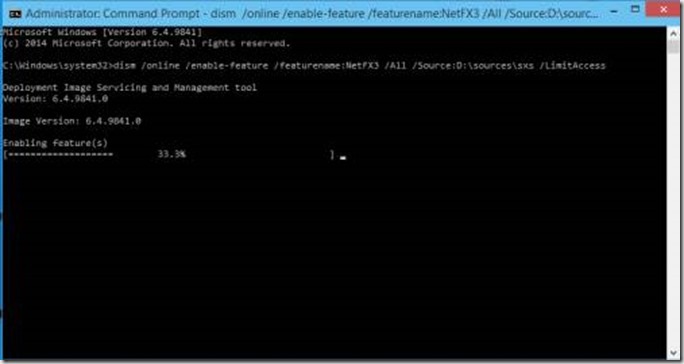 When run from the command prompt, it will start installing the .NET framework. It will take a while to complete the whole process. Once done, restart your system for the changes to take effect. 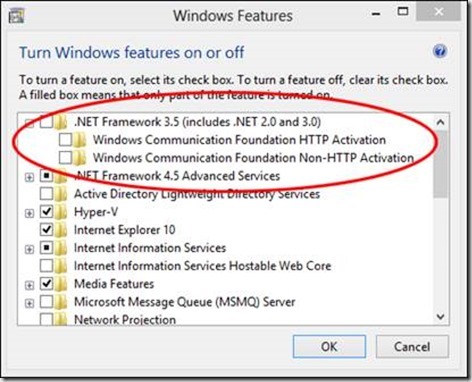 After completion of this process .NET Framework 3.5 feature enabled. Restart and then you good to go for the installation of your application.